You know, there’s a long history of the Chrysler TC by Maserati garnering little to no respect. Almost from the moment it was introduced it was dunned as a bit of a joke. That continued even here as yesterday’s ’89 with its rare Maserati-Cosworth DOHC head and Getrag stick got derided in the comments. Its $10,000 price proved to be no laughing matter however, falling in a 78 percent Crack Pipe loss. I guess it really doesn’t pay to have friends in high places. One issue that faced the seller of yesterday’s Chrysler was just how to position the car to potential buyers. It was too nice and too rare to flog as a daily driver, but just a little too weird to proffer as some sort of museum piece to anyone but the most avid Mopar fanatic. 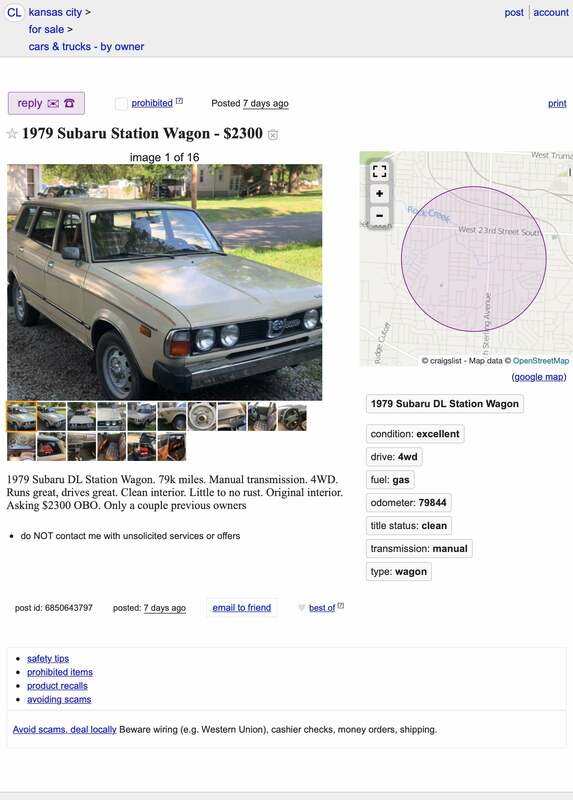 A similar challenge faces the seller of this 1979 Subaru DL wagon. Yes, it’s cute as a proverbial bug, and true it does seem to be all intact save for a absent radio. Still, considering its age and capabilities, what exactly would you do with it? Now, I want to preface this conundrum by making you all aware that this is a ‘70s small car. That means being saddled with double digit horsepower, and while the car weighs little more than a canary’s kumquats that still means getting up to freeway speeds is going to be a time intensive proposition. It’s also smaller than damn-near anything out there today save for the Mini Cooper and Fiat 500 so should your proportions are what people charitably describe as “ample” then you and your car mates might be a little bit too chummy when out for a drive. That all being said… well, just look at it. Have you seen any other car that looks so friendly and eager to please? It’s like a puppy. This is the first generation of Subaru’s Leone, which came to America sans nameplate, gaining a two-letter model designation instead. The engine is Subaru’s EA71 “narrow case” flat four. That OHV mill gives it up to the tune of 67 horsepower and 81 lb-ft of torque. Small numbers to be sure, but aided here by a four-speed stick and independently-sprung 4WD. This one features beige paint on the outside, along with some contrasting stripes down the sides. Those have seen better days, but overall the car looks solid and able to be driven without social stigma. The interior compliments that by being awash in glorious brown plaid. I’m not sure what clan this pattern represents but if I were to guess I’d say it was the McAwesomes. Sadly, the driver’s seat shows some tears in that wonderful plaid. The dashboard also exhibits some age-related cracking and one would guess that other hard plastics in here are as brittle as middle schooler’s self esteem. Mileage is a modest 79,000 and the car comes with a clear title. 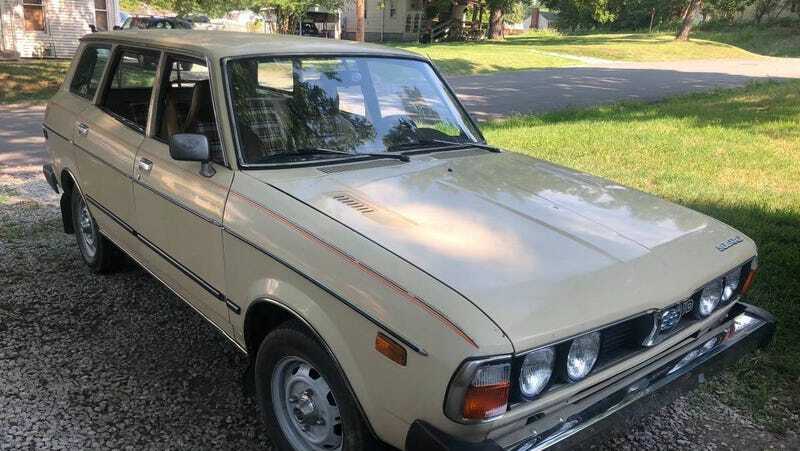 The seller claims the car “Runs great, drives great.” and that there’s “Little to no rust.” I think those are both major attestations in the car’s favor. Another perhaps is its $2,300 asking price. Now, that price brings us back to question at hand which is, what exactly would you do with a problem like Maria… er, I mean an old Subie like this? Would you brave the possibility of daily driving it? Or would you keep it around for just special occasions? In the latter case, what exactly would be one of those occasions? See? I just don’t know what to do with this Subaru even at that reasonably modest asking. Let’s see if you have better luck. What do you think, could you find it in your heart to spend $2,300 to call this little 4WD wagon your new best friend? Or, even at that much do you think there would be compatibility issues? H/T to 32many for the hookup!